Become a part of the WEBS Program! The Wilkes University Science, Math, and Computer Science Departments are pleased to offer an exciting and innovative Science Summer Camp for young women. The WEBS Summer Camp will give campers the opportunity to investigate many areas of science through hands-on laboratories and activities. 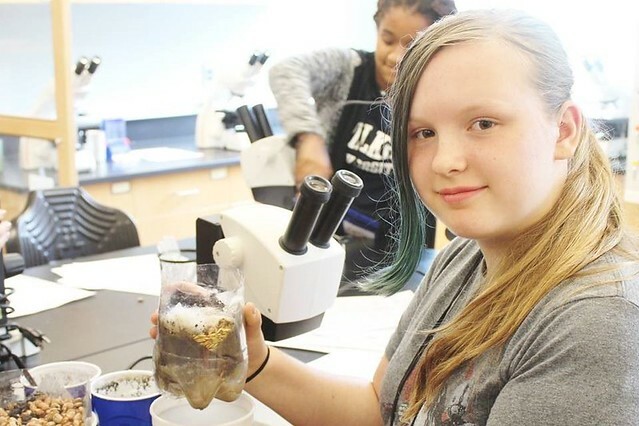 WEBS camp participants will address scientific questions, acquire essential laboratory skills, and develop important critical-thinking skills by working directly with Wilkes University faculty, staff and students on a variety of scientific projects. Monday through Friday: 8 a.m. - 3:30 or 5:30 p.m.
Make checks payable to Wilkes University WEBS Program. Need-based Wilkes University WEBS scholarships are available. Contact Ms. Debra Chapman for more information and an application. This program is designed for young women who have a sincere interest in the sciences, have potential for a career in the sciences, and wish to develop the skills and knowledge necessary to reach their full potential in this field. WEBS 3.0 has been established for rising sophomores through seniors, and beyond. It is beneficial for young women who know they want to continue their academic careers post high school by continuing on to college; however, it is also a lot of fun.